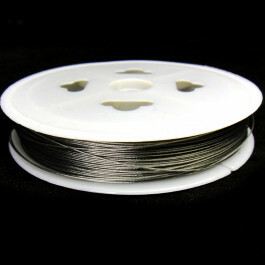 Tiger Tail , Silver Gray Beading Wire ~0.38mm in Diameter, 80m Roll. Tigertail is a strong, thin wire made out of multiple threads of stainless steel cable that have been braided together and then coated with nylon. Tigertail wire is the strongest jewelry beading wire and should be used with heavy, large beads and natural gemstone beads with rough edges and large beads. The wire is stiff, and cannot be bent into wire wrapped loops at its ends like other types of beading wire as it will form kinks. Instead, Tigertail is attached to jump rings and clasps with crimp beads.